This tokcha  appears to have served as a pendant; it is a thin (145 mm) medallion suspended from the central hole and possibly affixed with the loops of the lower rim, which also show irregular signs of wear. These loops are potentially functional, but their design more probably reflects the bead or pearl roundel motifs which were very popular throughout Asia during the sixth to ninth centuries. Tibetans highly esteemed textiles and silver wares with addorsed and confronted animal or bird designs which were imported via the Silk Route, either from Central Asia or from China, where these Sogdian fabric designs were copied in Sichuan. Tibetan silversmiths also adapted Sogdian designs and techniques during the eighth to ninth centuries. In this example, rather than following the Sogdian preferences for imaginary birds, we see relatively realistic peacocks perched in profile on a simple stem with a three-petal flower between them. The peacock is not native to Tibet or Central Asia, but flourishes in India. The two birds face each other with confronted bodies but with heads turned backward. The neck is particularly elegant and elongated. There is a single band immediately below the beak, and at the base of the neck a pair of bands appears. These bands recall the pativ of Sogdiana, but here no streamers are attached, and there is no indication that such streamers were present. The scroll decoration between the heads is now broken on one side. It formerly stretched completely between both birds. The roundel is solid cast and very smooth in front; on the reverse, there are small cavities in the bodies and heads of the birds but the rim is solid and smooth throughout. This design is of interest in relation to a pair of confronted birds with entwined necks decorating a Tibetan silver vase attributed to the ninth century . Those birds too have high crest feathers, almost as a crown, like the peacocks on this roundel. Roughly contemporary is a tokcha of confronted birds with entwined necks and similar loops on its lower section. Although that tokcha is made of a largely copper alloy and has carving of a lesser refinement than this peacock roundel, their similar shape indicates a specific function for these tokchas . As they are slightly too large to be worn comfortably on the body, they may possibly have been attached as weights to leather straps used to tie wooden book covers together. 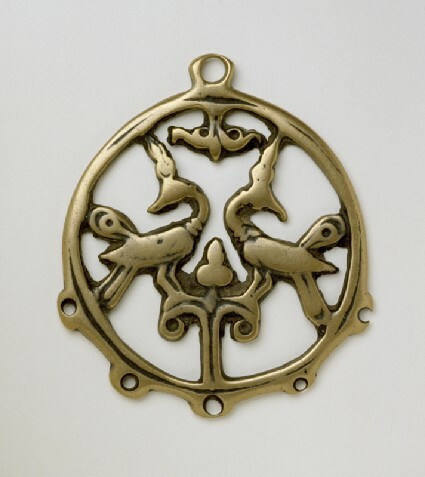 In the context of the great influx of Indian and Nepalese pandits, translators, and artists which was then reaching Tibet, it would not be surprising to find a roundel with Indian peacocks . In the Tabo monastery, waterfowl can be seen in fabric patterns on the statues of life-sized clay Bodhisattvas modelled c. 1040, but these are aligned rather than addorsed creatures in a pearl surround. Confronted lion roundel motifs decorate the ceiling of an eleventh-century chapel at Shalu, but such patterns became infrequent subsequently . This tends to suggest that the period of this type of roundel tokcha may terminate by the first half of the eleventh century . 1 Published in Anninos, 'Tokches: Images of Change in Early Buddhist Tibet', p. 94, fig. 5. 2 See Heller, 'Archeological Artefacts of the Tibetan Empire in Central Asia'. 3 Another tokcha with similar loops on the rim, decorated with two addorsed vyalas, is illustrated by John Bellezza, 'Togcha', pl. 2c. 4 A peacock is carved on the wooden lintels of the Lhasa Jokhang, traditionally attributed to Nepalese artists of the 7th-8th century: see Introduction, fig. 8. 5 See Tucci, To Lhasa and Beyond, p. 159, for a photograph of the late eleventh-century clay Bodhisattva statues at Grathang, still wearing robes with confronted lion roundels, although by then stylized lotus and concentric or geometric motifs were more popular in Tibet. 6 Wandl, 'The Representations of Costumes and Textiles', in Klimburg-Salter, Tabo: A Lamp for the Kingdom.